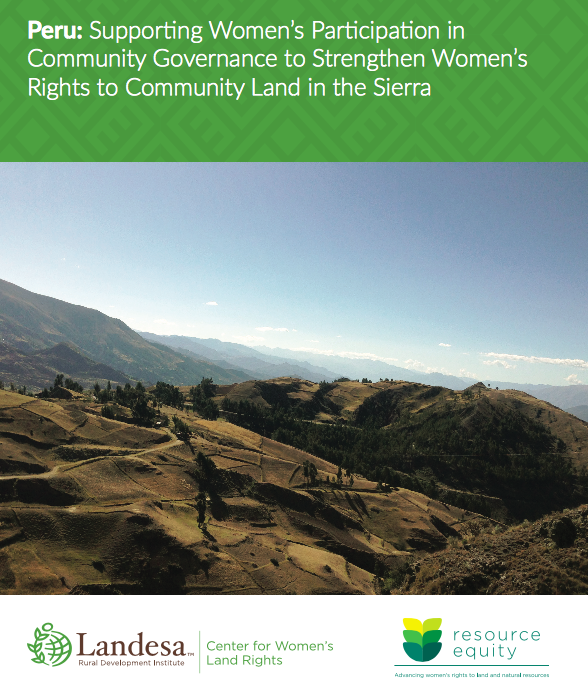 This case study identifies good practices and lessons learned about enhancing women’s participation in community land governance in rural Peru’s Puno and Ayacucho regions of the Andean Highlands. The two-year project launched in 2014, “Indigenous Quechua and Aymara peasant women’s access to land governance in their communities,” was implemented by Servicios Educativos Rurales (SER), a Peruvian national NGO that works to promote the exercise of human rights through democratic participation and rural development. The project aimed to reduce the gender gap in the use and control of communal land and resources, increase rural women’s involvement in land tenure governance in their communities, and support rural women’s access to productive resources. The project aimed to empower women by increasing their participation in community governance structures promoting women leaders and strengthening community governance institutions to safeguard women’s participation toward changing gender-neutral and discriminatory community statutes.